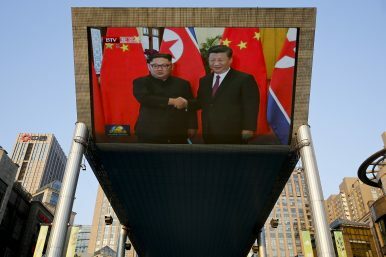 People bicycle past a giant TV screen broadcasting the meeting of North Korean leader Kim Jong Un and Chinese President Xi Jinping during a welcome ceremony at the Great Hall of the People in Beijing (June 19, 2018). In the Chinese Communist Party (CCP), tension has always existed between principles of collective leadership and the tendency toward personality cult. As we observe an important Chinese delegation in Pyongyang during the Democratic People’s Republic of Korea’s (DRPK) 70th anniversary, Xi Jinping may be absent, but it is his personal imprint on China’s foreign affairs that bears watching. How deep does his control of the CCP run, how much trust does he place in his colleagues, and why might these things matter for his North Korean counterparts? This essay attempts to clarify the matter by delving into the specific political culture of the CCP, looking at references to “Xi Jinping Thought” in North Korea, and assessing Party-Party relations with Pyongyang, which go beyond the relationship between Xi and Kim Jong Un. The essay concludes with Xi’s anti-corruption campaign and its possible impact on Chinese-North Korean relationships in the shared border region. When Chairman Mao Zedong stood on the cusp of fundamental victory over Chiang Kai-shek’s forces in northeast China in early 1948, he complained that getting his main general in the region, Lin Biao, to go on an offensive was “more difficult than getting a cow to jump over a fence.” Mao was eager to fight the final decisive battle and sweep the Party’s enemies out of Manchuria, but Lin refused to budge, armed with knowledge of the local conditions and a more gradualist strategy. Lin also had the services of some 50,000 Korean troops who would later fight for Kim Il Sung, and the use of North Korea as a strategic rear area for cross-border logistics. Mao left military strategy in the northeastern region to his peers, and the CCP ultimately conquered the vital strategic expanses of northeast China and the mainland as a whole. Mao’s comrades-in-arms during the 1940s and early 1950s had the latitude and the political capital to argue against Mao’s excited and often hot-headed directives to “seize the initiative” and go on attack against enemy armies. After crisis erupted in Korea, Peng Dehuai ran the Chinese war effort on the peninsula, and felt no compunctions about telling Mao to slow down. Peng also told Kim Il Sung what to do, having absorbed effective command of the fragmented North Korean army after its horrible defeat of autumn 1950 — which is why DPRK propagandists have mostly edited him out of their photos and museum exhibitions. In domestic policy, Mao’s pressure to accelerate the pathway to socialism was constant; he bluntly expressed his desire to radicalize the struggle and turn to internal upheaval. Only with consolidating Tibet were the tables turned, where radical provincial cadres like Li Jingquan wanted to immediately crush and convert Tibetan differences. He was also less than critical of Kim Il Sung’s personality cult, saying the compulsive veneration of the North Koreans toward their leader was essentially harmless and not unlike the cult around the Dalai Lama, even though this was hardly a majority opinion within the Central Committee at the time. Among the small and tightly-connected top clique of the CCP, the cajoling of comrades, engaging in “red-eared and hatless” debate — alongside the ingestion of plenty of sleeping pills and nicotine — was part of the rise to power. With the Great Leap Forward and the Cultural Revolution, Mao got his final revenge on the comrades who sought to temper, redirect, or otherwise mutate his ideas of constant revolutionary struggle. Peng Dehuai was purged and ostracized for daring to call attention to famine in the Chinese provinces and to challenge Mao’s policy of agricultural communes. (The famine in northeast China was not nearly as severe as in provinces like Sichuan, Anhui, and Gansu, but hungry Chinese and ethnic Koreans nevertheless crossed the border into the DPRK in search of food in this period.) As for Lin Biao, in spite of producing “The Little Red Book” in 1964, fomenting foreign Maoist groups around the world, and being named Mao’s successor publicly in 1970, he died in a probable coup attempt in February 1971 and opened the way for major changes in Chinese foreign policy. Xi Jinping is not Mao Zedong reincarnated, and unlike the North Korean leaders, there is no hereditary successor. Nor, as in North Korea, does the leader’s physical resemblance to a prior elderly state founder by itself create an aura of legitimacy where no real mechanisms for popular consent exist. Xi has scrapped his country’s constitutional term limits and insisted upon or allowed his “thought” to be inscribed on academic life. The state-run press in China engages in ridiculous repetition of Xi’s name and “One Belt One Road” formulae, the recent People’s Daily front page being only the most meme-worthy instance. In terms of his age, at 65, he is Mao in 1958. Like Mao in his time, Xi wants to be seen as the ultimate authority in nearly every sphere of Chinese political life. But Mao also had rivals and corruption within the Party, and, like Mao, Xi has before him the seemingly endless task of achieving consensus among the Politburo. He also needs to utilize the hatchet and the scalpel of Party disciplinary organs in order to attack corruption, accuse rivals of corruption, and maintain inner-party cohesion, or, as he calls it, “healthy political ecology.” This connects closely with the Party’s foreign policy and in particular its relationship with North Korea. What does Xi Jinping’s ascendency mean from the North Korean perspective? For one thing, it makes Chinese diplomats sound more North Korean, both in terms of accepting of cults of personality and in terms of what we might call “normalizing” North Korea’s military-first ideology. At an event at the Chinese Embassy in Pyongyang to celebrate the 91st anniversary of the People’s Liberation Army on August 1, the Chinese ambassador, Li Jinjun, welcomed a large delegation led by a Korean People’s Army general and including representatives of the People’s Armed Forces (militia) along with a host of other North Korean institutional connection points with China. China has a new defense attaché at the Embassy, one Jin Tao, who was previously posted in Brazil and London. Jin launched into a speech describing how the People’s Liberation Army (PLA) was “deeply implementing Xi Jinping’s defense-strengthening ideology” and moving forward to protect and guarantee success in “the hundred year struggle to great rebirth of the Chinese dream.” The nod to Xi-ism was new — the speech by the Chinese attachés at the same anniversary in Pyongyang the prior year did not include any — and also sounded not at all unlike Lin Biao talking about Mao. His discussion of the PLA’s role managed to mirror precisely the DPRK’s rhetoric for its nuclear weapons both under Byungjin and the New Strategic Line, namely that overwhelming force is intended to safeguard and guarantee success for domestic economic development. Jin evoked Kim Il Sung and Mao in praising friendship for China and North Korea as being rooted in the lessons from the old generation of leaders from the two countries. Much more promising from the North Korean perspective were the notes on the PLA’s desire to “ceaselessly consolidate and develop the traditional friendship between China and North Korea’s militaries in order to safeguard regional peace and stability.” Again, this particular statement had not been made the prior year. The North Korean general at the event appears to have gotten the same memo as other North Koreans who have been visiting China this year, and praised “Xi Jinping as the Party core” who would fulfill China’s “powerful military dream” at an early date. He proceeded to say that the North Korean military were “pioneers of DPRK-China friendship,” either a reference to the 1940s aid to the CCP during the civil war or a more pointed reference to the figurative limb that the People’s Liberation Army goes out on when supplying North Korea with mobile missile launchers. As North Korea gears up for its 70th anniversary celebration, Politburo Standing Committee ally Li Zhanshu is being sent to Pyongyang rather than Xi Jinping. The choice seems likely to stir some speculation that the Chinese sent Li simply because they did not want to provoke further ire from Donald Trump’s overactive Twitter thumbs. Certainly it would be easy to see how Xi’s presence would have, in effect, offered visual proof to the Americans that China was going soft on sanctions and fully embracing Kim Jong Un before the North Korean leader had taken the simple step of declaring even the barest of nuclear catalogues to Mike Pompeo. This would be a very simplistic analysis indeed. Such a narrative — besides exaggerating the importance of Trump’s Twitter account — also effectively ignores that high-level CCP delegations to North Korea have typically been shared labor among members of the Politburo. There is a long tradition of continuity and collective diplomacy for the Chinese when dealing with North Korea, and again, what was true in Mao’s time remains true today. Li Zhanshu’s trip to Pyongyang will run along the lines of similar CCP Politburo-member-led delegations to North Korea in the era since Kim Jong Un stepped into the global limelight. These trips occurred in 2010 (Zhou Yongkang), 2013 (Li Yuanchao), and 2015 (Liu Yunshan). This week’s visit will maintain and expand high-level Party-to-Party relations, and further buttress Chinese Communist support for the succession and consolidation of Kim Jong Un. There is also little doubt that Li Zhanshu’s time in Pyongyang will involve rhetoric about “Xi Jinping Thought” and references to Xi’s great plans for China. There will only be muted, if any, references to Xi Jinping’s “One Belt, One Road” framework, but certainly the “historical character” of Xi and Kim’s three prior meetings earlier this year will be hailed with much toasting and drinking of soju or baijiu. Despite the touting of “Xi Jinping Thought,” power consolidation is still underway, and this too is having an impact on China-North Korea ties. Purges have returned as a central element of the political culture in Beijing, and the same is true in the provinces. Areas where Bo Xilai, a former Central Committee member and rival of Xi’s, once roamed and was praised by the Party-controlled organs are under particular scrutiny. This includes not just Chongqing, but Dalian and Liaoning province, important interfaces for North Korea. Although Bo was purged in March 2012 and went on trial in August 2013, Party newspapers and local committees are still being instructed to root out his evil tendencies, alongside an unending anti-corruption campaign. More recently, the Politburo was cleansed of Sun Zhengcai, a former governor of Jilin province abutting North Korea. Many analysts had tapped Sun as the possible successor to Xi, so his ouster last year on corruption charges was particularly shocking. Local areas of China abutting North Korea have felt the pinch of Xi’s anti-corruption campaigns. Donggang is the seaport for Dandong, and its fishing and shipping sectors are important points for North Korean trade as well as UN sanctions enforcement. Although it got no press in the Anglosphere, a Chinese fishing firm based in Donggang which had ties to the North Korean fishing fleet in the Yellow Sea had its leadership arrested and investigated. Officials up and down the Chinese side of the border with North Korea, some with portfolios that included work with the DPRK, have been put under investigation and ousted from their positions. Xi Jinping is therefore putting his stamp on the Chinese-North Korean relationship at the local level, as well as at the top levels. By contrast, the Korean Workers’ Party has been an essential oasis of administrative stability and calm over the past year. Although Kim Jong Un has complained openly about a few local facilities on his on-site inspections over the summer and aimed even a barb in the Party press at his own Cabinet for poor economic planning, Kim has removed no major figures in 2018. To the contrary, even figures once thought to have been purged — Hwang Pyong So, for instance — have accompanied the North Korean leader, laughed at Kim’s witty remarks, and scribbled dutifully in their little notebooks while Kim Yo Jong’s cameras snapped. Behind the facade of Party unity and bilateral solidarity lie deep fault lines and disagreements. Relationships between Chinese and North Korean comrades, and within the CCP itself, will remain outwardly harmonious, but core questions like Xi’s ultimate exit from the scene and the security of even his most sycophantic comrades will remain. This particular visit to Pyongyang by a CCP Politburo member arrives at a moment where no apparent rebalancing is occurring; neither Kim nor Xi look primed to be brought back to earth anytime soon. Collective leadership and purges based on anti-corruption campaigns are familiar formulae for Kim Jong Un and Xi Jinping. As Kim surveys the pliant crowd and chats with Li Zhanshu, he will surely be looking for signals from Xi, and taking a page or two of advice about how to remain at this Mao-like apex for as long as his mortal body will allow. Adam Cathcart is lecturer in Chinese History at the University of Leeds and the editor of SinoNK.com.